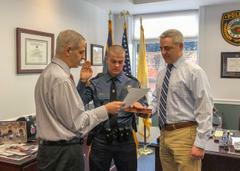 The Department is pleased to announce the hiring of a new police officer, Quinn Schulhafer a Monmouth County resident who holds a Bachelor’s Degree from Rutgers University. He previously served in this agency as a SLEO II Officer and is currently a New Jersey Army National Guard reservist. He will be attending the PTC waiver program at the Monmouth County Police Academy beginning in June of 2019. He was officially appointed today, Monday, March 25, 2019.